Street creep is a problem that is caused by thermal expansion and contraction of exterior concrete pavement that surrounds a home. As this concrete expands against a driveway with inadequate expansion joints, the driveway is pushed against the garage slab, which in turn pushes against the foundation, causing damage. The GeoLock® Street Creep Repair System will prevent future damage with new expansion joints in your concrete driveway as well as a steel wall anchor system that reinforces and straightens your foundation walls. This provides a permanent, reliable solution. At DBS, we solve problems like street creep every day! Call us for a free street creep repair quote today! 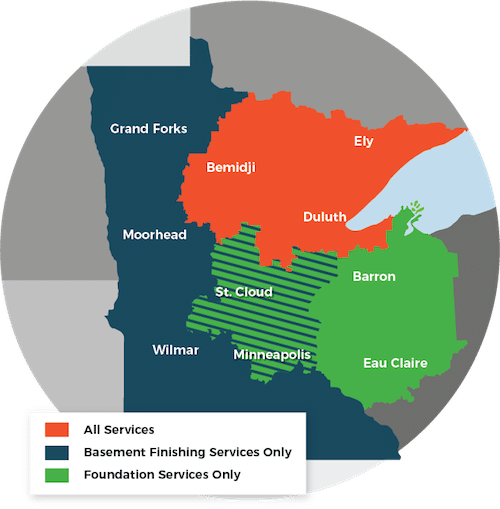 We serve Duluth, Superior, Minneapolis, and many nearby areas in Minnesota and Wisconsin. There's no way to stop the normal expansion and contraction of concrete slabs that occur with temperature changes. But it is possible to eliminate the damage caused by this movement. The foundation repair contractor will install one or more new expansion joints in your driveway to allow individual slabs to move without pushing against the garage slab and your foundation wall. Each joint is filled with a resilient backer rod and a durable, flexible polyurethane sealant. Once the expansion joints have been created, we install the GeoLock® Wall Anchor System. These wall anchors will stabilize foundation walls that have been pushed in, cracked or otherwise damaged by street creep. Thanks to the GeoLock®'s adjustable capability, it may be possible to go beyond wall stabilization and even use the system to restore wall straightness. During installation, holes are cut through the garage slab floor, and soil is augured out to allow for earth anchor placement. Next, holes are drilled through the foundation wall so that a long threaded steel rod can connect each earth anchor to a steel plate that applies clamping pressure against the wall. Once the earth anchors, rods and steel plates are in place, nuts are tightened on the rods to stabilize the wall and (if possible) pull the wall back towards its original position. The holes in your garage slab are carefully patched and your worries about street creep damage are over. Installing new expansion joints, combined with the Geo-Lock™ Wall Anchor System is exactly what you need to stabilize foundations that have been damaged by Street Creep!